This level of treatment is neither new or strange to me. My decision to write about this topic is in part a response to the UN’s recent ruling that racial profiling against people of African descent in Germany has become ‘endemic’. After conducting research across 8 German cities – including Frankfurt, Cologne, and Berlin – a UN panel had concluded in their statement that ‘although the [German] constitution guarantees equality, bans racial discrimination and enshrines the inviolability of human dignity, these principles are not put into practice’. This level of treatment is neither new or strange to me. Racism should not be a new concept to you either. 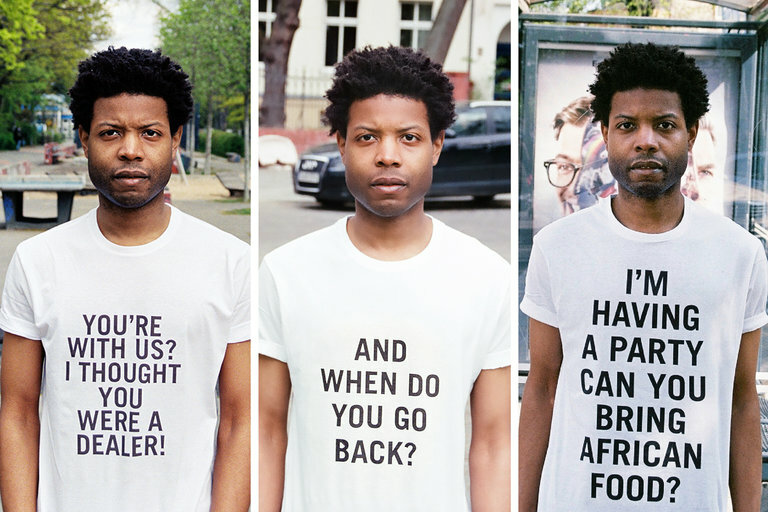 Whether you believe it or not, Germany, much like the UK, has been and still is a playground for anti-black racism. We see this in the profiling and consistent public misrepresentation of black people and black culture. Of course this treatment is not limited to these two nations, but based on my experiences in these environments, the evidence and experience of it is rife. So much so that, as I settled into my new apartment, a small fear began to grow inside me. The romance of living in a new city quickly wore off when I came to terms with the reality of fending for myself, without any sight of a team-mate, colleagues, or friend close by. Although grateful for the opportunities that came my way, I became increasingly concerned with being able to create or get involved in safe spaces catering specifically to black and brown communities. Although I made the move alone, I also made a promise to never feel lonely. Luckily, with the help of online spaces, I have gained access to a series of communities with whom I can clearly and unashamedly voice my concerns. Through these digital platforms, not only do I learn how to grow spiritually and creatively, but I am reassured in the confirmation that the adversity I feel is not imagined. Often black folks are told they are too sensitive when it comes to discussing race and institutional hierarchies. A common response is ‘I’ve suffered too, so get over it.’ Not only are these retorts unhelpful, but they actively support oppressive systems that thrive off the dilution and eradication of the marginalised. Even in cities such as London, Birmingham, and Manchester where ethnic demographics are incredibly diverse, the urgency of these voices often goes unheard, unless of course it leads to a fatality or implicates someone socially or politically reputable. It seems odd that in a nation such as Britain, where diversity is the default, communities are still rallying for radical change. Fast forward to Berlin, the German capital is hardly the melting pot one may think it is. According to a 2015 survey by Business Location Centre, only 4.2% of Berlin’s population is of African descent; a stark difference in comparison to say Paris. Although by French law, no official ethnic demographic count for the city is conducted, the influence and visual presence of Africans is much more prevalent. That is not to say that their presence overshadows the threat of racism, on the contrary, the divide between French-Africans and those that are of European lineage is deeply embedded in French society. Germany’s case is slightly different. Whereas France maintained its colonial power – see the entire region of North Africa – Germany ‘lost’ most of its influence after the eruption of World War I. Although it is reported the country catalysed what was dubbed ‘Scramble for Africa’, countries such as France, The Netherlands, and Britain succeeded in the regulation of trade, people and constitutional powers in the continent. As a result, present day Germany is relatively homogeneous, and out of that homogeneity spring politically dated beliefs towards people of African descent. If we consider the rising numbers of migrants across the German border in addition to the continual lack of race-based data within Western European, growth in racial profiling and discrimination is imminent. Berlin is a city that prides itself on being ashamed of its past through the visibility of the Berlin Wall and Holocaust Memorial yet actively denies basic rights, healthcare, and social standing for those they have welcomed or, reluctantly accepted. In my short time here, I have been stared at, inappropriately touched, called racial slurs, followed, accused of stealing, denied roles or positions and made to feel less than what I am. I am sure there are many other black people living in Europe, maybe even born here who only know this as their reality. When you are visually and statistically an anomaly, you are reduced to one simple frame in which people can picture you. My life and my work are an act of constant resistance, and each day brings a new challenge. If often feels like you’re swinging at things that aren’t there, knowing that whatever it is you’re after is a major influence over your life. To say the least, the UN’s findings is too little too late; nonetheless, it’s important that these discussions are slowly implemented on a global level. I have often wondered why blackness is almost always contextualised through an Anglo-American lense. Europe, Asia, and Africa all have their own form of anti-black racism – how long are we to wait for this report, or the next case study, before we take it upon ourselves to teach and nurture people? I don’t have the answers, nor should I. I as a black person should not have to continually explain that wherever there is a hierarchical structure that prioritises, supports, and cultivates space for white supremacy, there you are likely to find anti-black racism. Not for free, at least. If these ideas are nothing new, then why write about it again? I guess it’s because the white West has taken its time in reaching a conclusion black and other people of colour had figured out long ago. I’m writing about it again, because I’m tired, and for a slither of second, a part of me believes change will come.